Registered riders of the 2010 Spin Around the Clock (www.spin24.ca) of the Livia Stoyke Foundation (www.livia.ca) who raise $100 or more in pledges are eligible to enter a draw for a 1 week rental of a Deluxe Houseboat from Sicamous, B.C. The CruiseCraft III is approximately 2,200 square feet, with five state rooms, and a double bunk room, sleeping up to 22, including 2 cuddies for children. The craft has a full kitchen with utensils, fridge, freezer, oven, stove, microwave, washer, dryer, hot tub, fireplace, and 2 wet bars. The houseboat is complete with everything required, except bedding. Limited dates are available for the fall of 2010 or spring 2011. Conditions: Prize winners are responsible for transportation to and from Sicamous, for the cost of consumables (gasoline, food etc. ), and for a one-time turnaround fee, which includes cleaning, sewage disposal, and top-up of liquids (approximate cost $300). Dates subject to availability. Members of the Livia Stoyke Charitable Foundation and their immediate family members are not eligible to take part in the draw. Join us on April 2 & 3 at the WEM Ice Palace for 24 hours of stationary bicycle madness, live entertainment, prizes and fun! Join an existing team, start your own, or email us if you are looking for a home. 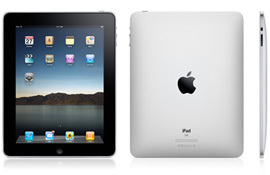 * Prize will be awarded when iPad available in Canada (expected end of April). Members of the board of the Livia Stoyke Foundation and their immediate family members are not eligible. Participants who register online by 4 pm on March 20th, but do NOT participate and/or do not raise the minimum pledge amount may be removed from the draw. In the event of a dispute, the decision of the Organizer is final and binding. Prize will be drawn on Saturday, April 3, 2010, at 5pm. Winner does not need to be present to receive the prize.